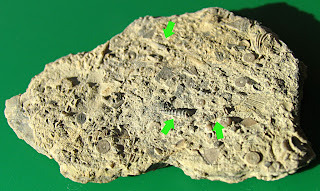 The green arrows point to the Cornulites (worm tubes) on this fossil laced plate found in the Kope Formation. These fossils of creatures that existed in the Ordovician Period in the area now known as Carroll County, Kentucky. My Index Fossils of North America book lists the genus as being named by Schlotheim in 1820.